On December 29th, 1958, the day after the 1958 NFL Championship Game between the Baltimore Colts and New York Giants, The New York Times' Arthur Daley wrote about the game, the roaring, partisan crowd, and the exciting overtime finish. From his writing it is clear that the NFL is just now starting to arrive on the national scene. He ends his article with the telling line "This was a football game. Wow!" Daley, Arthur. 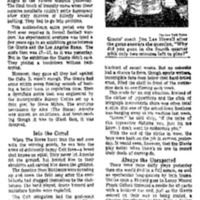 “Sports of the Times: Overtime at the Stadium.” The New York Times, December 29, 1958. http://search.proquest.com.ezproxy.wlu.edu/hnpnewyorktimesindex/docview/114493914/54F83A7364A344BFPQ/3?accountid=14882, “Sports of the Times: Overtime at the Stadium,” The American Century, accessed April 20, 2019, https://americancentury.omeka.wlu.edu/items/show/142.